Doubles coaching for ladies will take place each Thursday at 7:30pm. The cost for the coaching session will be €10. Enter via paper Entry Form in PDF format attached to the email. On-line entry is preferable. Any queries in relation to the tournament please forward them on to IrishOpenVets@gmail.com. 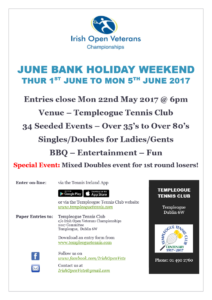 Greystones LTC is having two open tennis tournaments over the Easter weekend. On Easter Saturday night we will have a graded mixed event – and on Easter Monday morning we will have graded ladies’ doubles and mens’ doubles events – two tournaments – enter one or both. We would be delighted to welcome your members to either day! Below is some information on each event. We would really appreciate if you could distribute this information to your members and also put the attached poster up in your clubhouse. Many thanks. Graded mixed tennis for 24 pairs – graded into 6 groups from 2/3 to non league. Dinner and socialising afterwards in the bar. Cost of event including dinner after €10. Friends welcome to support and socialise afterwards – if they wish to have food its €10 also. Small prizes for the winners. lunch and socialising afterwards in the bar. Cost of event including lunch €10. Preferably enter with a partner – otherwise if someone of similar standard is also available we will try and match you up. Entries close on Wednesday 12 April but please enter early to make sure you are in!